Testimonials | Outdoor Hardscapes | SoCal - South Bay - Inland Empire | Pools & Spas, Outdoor Kitchens, Hardscaping, and more! We couldn’t be more grateful to our loyal customers! If you have worked with us, we would love to hear about your experience. Please take a moment to submit a review and help us continue to grow and improve. Most outstanding contractor I have ever worked with. Jim and his team were Ethical, Respectful, Honest, Flexible, Creative, and Considerate. I will use Outdoor Hardscapes for any additional work I do and would recommend them to anybody doing an outdoor remodel. We interviewed 5 contractors before speaking with Jim Walsh, the owner of Outdoor Hardscapes. He impressed us from the initial time he provided his estimate. Most other contractors started their pitch with “what is your budget” and pushed h****** getting a number before talking about what they would do. It was pretty clear they wanted to see how much money was in it, and then back into as little work as possible for what we would pay. They also would only provide a bundled price for a whole package and pushed back on doing an itemized estimate allowing us to pick and choose “a la carte” based on pricing of each item we discussed. When Jim came over he started with “what do you want to do”, and never tried to pin us on a budget. He actually could tell we were trying to figure out how best to allocate our budget and immediately suggested an a la carte approach so we could get the most for our money and ensure we loved what we got for what we were paying. Jim personally drove us to 3 of his previous clients to show us his work. Not only was the work great. We spoke with every client individually, without Jim present, and every one raved about his work and professionalism. Jim and his team did phenomenal work. The result was exactly what we were hoping for. Jim not only built what we asked but provided design recommendations when we struggled. His ideas were great. Our project had a 6 week duration. Every Friday Jim’s team cleaned the area as best that could be done mid-project. They reset all of our outdoor furniture and made the space as functional as possible for us. We never asked them to do this, they just did it know we would have the family out back over the weekend. As with every project, details change throughout the process. Although there were no major adjustments we did have some minor changes that I am sure many other contractors would have required additional funds for. Jim never once hit us with a change order for more money. Jim is an outstanding professional and every one of his subcontractors were great as well. One of the best experiences we have had with any renovation project. We did a complete outdoor renovation that included the front yard, driveway and backyard. The major renovation was the backyard where we added a pool, covered back porch area, BBQ area and fire pit. The workmanship and attention to detail was outstanding. Jim, the owner, is fantastic to work with. He really listened to our vision and made it come to life. As with any renovation, there were some bumps in the road but Jim never made us feel like we had to worry as he took care of them and kept on working. We had previously renovated our kitchen and bathroom before this project so we were expecting some problems and delays along the way but working with Jim was the BEST experience we have ever had. He responds promptly to any questions or concerns we had, he is a forward thinker and thought of small details that we did not think of and he has created an outdoor living space that makes us feel like we never have to go on vacation again because it is now right in our backyard! If you want quality, fair and honest work then you would be a fool not to hire Jim and his crew. A+!! This was one of the best home remodeling experiences we have ever had. This company is very professional. Jim took time to answer all of our questions when he came to do the estimate. He made many good suggestions. As soon as we decided to do the work, Jim told us the date and time that his crew would be at our house, and they showed up right on time. They were there every day to do the work, and the project was completed quickly. At the end of the project we wanted a couple of things corrected, and Jim had his crew there the next day. They went above and beyond to do what we requested. The workers are very good craftsmen, and they are very careful. We had some sprinklers very close to the retaining wall, and they did the work very carefully so that the sprinklers wouldn’t be damaged. They cleaned up the entire area when the project was done so that we had nothing to do. We are very happy with how the project turned out. We’ve had many compliments from our neighbors. 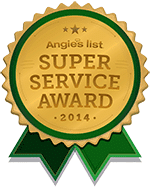 We are so proud to have received this badge from Angie’s List. Thanks to everyone who submitted reviews! All the work went great and the results were excellent. The costs of projects were most reasonable. For example, the cost of the beam work was 25% of the next lowest bidder. The owner, Jim Walsh, was honest, knowledge, and professional. He was on top of everything and left the site cleaned up every day. Not only is he knowledgable about hardscape and water issues, but he is knowledgable about a number of construction issues and offered excellent solutions to issues. Jim is responsive, low-key, punctual, and readily available. I can’t say enough about Outdoor Hardscape and Jim Walsh. I would have no reservations about using Outdoor Hardscapes or recommending it. If you are looking for a company to do hardscape work for you — look no further. Jim takes real ownership and responsibility for the quality of the work. He wants the work to be done the right way so that the homeowner is happy. He went with me to the stone yard to pick out stone that I wanted. The team who do the work are the best. Not only are they excellent technically (and artistically with the stone), they are also the nicest people you would ever want to meet. They do their work responsibly and with pride and always find ways to be helpful to the homeowner as well. As an example — while the work was being performed at my house, it was hard to get trash cans from the side of my house to the curb for pick up because of construction work in the courtyard. The first week the team was here, I asked for some help. Every week thereafter, they remembered when my ‘trash day’ was coming and before they left for the day, brought my trash cans to the curb. Jim comes by to inspect the work and make sure everything is going well. I just don’t think it could get any better than Outdoorhardscapes, start to finish. Pride, responsibility, ownership, friendliness — it’s all there. This went better than we could have imagined. We had a huge retaining wall that over the course of 60+ years had cracked and become loose in some areas that we knew we would eventually have to get it replaced for safety reasons. We had Jim come out to do a backyard renovation estimate and we also had him look at this wall. It was clear before any backyard work got started we should take care of this wall first. His price was better than what we had anticipated in our heads (one of the reasons why we kept putting it off before meeting Jim) and his workers showed up early (7:00 am) and were workhorses, staying until 5:30 pm. They were extremely fast and efficient and completed the entire job in four days. After the work was completed they cleaned up after themselves leaving our backyard as it was.